On the morning of May 7, 2013, National Institutes of Health (NIH) Director Francis Collins asked all of Twitter to let him know how sequestration, or across-the-board federal budget cuts, is affecting biomedical research. I extended this inquiry to training program directors. This is one of many columns on the impact of the sequester on programs that prepare future scientists. The written responses of Andrew G. Campbell appear below. Campbell is associate professor of medical science in the Department of Molecular Microbiology & Immunology at Brown University, and co-director of the Biomed Initiative to Maximize Student Development (IMSD) program. Funded since 2008 by the National Institute of General Medical Sciences at NIH, this IMSD program aspires to increase significantly the number of Ph.D.s from groups underrepresented in biomedical and behavioral research. Through personalized training featuring research opportunities, advising, and peer networking support that augment a 12-month stipend, graduates complete the Ph.D. on average in 5.5 years. Program outcomes have been documented in CBE-Life Sciences Education. 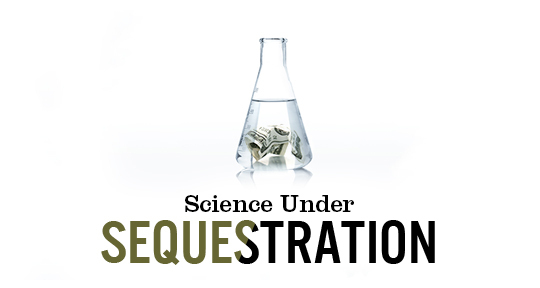 AAAS MemberCentral: Please describe how your IMSD program has been affected by the sequester. Andrew G. Campbell, associate professor of medical science in the Department of Molecular Microbiology & Immunology at Brown University: There are many ways in which the sequester has affected our minority graduate-student training program. We have begun to shorten the appointment period of graduate students as IMSD trainees, a developmental program for our graduate students before they transition to other funding mechanisms. This means less preparation and probably less readiness to be competitive and successful at the next level. By providing IMSD support, we have some leverage and oversight in providing what we regard as essential student training. With less support, our impact is weakened. As a result of the sequester, we are also reducing trainee travel to major scientific meetings — Annual Biomedical Research Conference for Minority Students (ABRCMS) and SACNAS are exceptions — where trainees would present their work and meet faculty with whom they might connect for postdoctoral training opportunities and even research collaborations. IMSD is less able to work with our graduate programs to bring in a diverse set of seminar speakers. Finally, we've had to become more conservative in our admissions decisions, resulting in fewer graduate students enrolled each year. This means fewer underrepresented prospects across the board and this translates into less diversity. Although Brown University does well in recruiting a very diverse graduate population, there is a concern over how much the sequester has erased some of those gains here and at other institutions. AAAS MC: In what ways have you adapted to the decrease in funding? Campbell: We admit fewer doctoral students to the program, which will result in reduced trainee population diversity in our various graduate programs. We must decrease support during the critical academic developmental period of trainees, from attending meetings to professional development training activities. This ultimately inhibits career launch. We've also narrowed the scope of external evaluation of our training programs. This will likely make the program less "outcomes-driven" and consumed by day-to-day management concerns. Overall, I've had to become more strategic with my time and curtail what I can do for the training programs with which I am involved. AAAS MC: How have various stakeholders responded to this funding dilemma? Campbell: Cuts create a greater non-academic/non-research workload burden on PIs. We are all doing less biomedical research, with fewer trainees, and have fewer resources to support trainees. Our graduate programs, fearing future funding constraints, are admitting fewer trainees, which is likely to extinguish the critical mass needed to keep training programs vital. AAAS MC: How has the experience changed your strategy for seeking future federal funding, and what advice would you offer others? Campbell: For anyone leading a program designed to encourage students to pursue science careers, think about the message and how to sustain optimism in the face of uncertainty. I am personally collaborating more while taking fewer risks, which essentially translates into investing in fewer people. If students observe this over their own period of training, the impact can be subtle but potent. AAAS MC: Put into broader context, what does the prospect of sequestration mean for U.S. science and your discipline in particular? Campbell: I do not view investing in science as spending money. It is simply transforming it into a usable form. Less funding means less work force development, which erodes the competitive edge the U.S. has maintained in the sciences for some time. We will end up with a smaller scientific work force. Given our changing demographics and the resulting need to broaden participation in STEM fields, sequestration will certainly have a negative impact on the diversity of that work force.